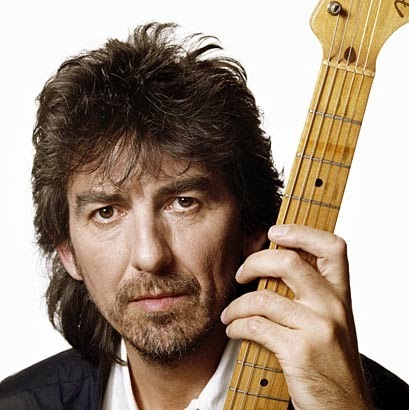 George Harrison, MBE, was an English musician, multi-instrumentalist, singer and songwriter who achieved international fame as the lead guitarist of the Beatles. 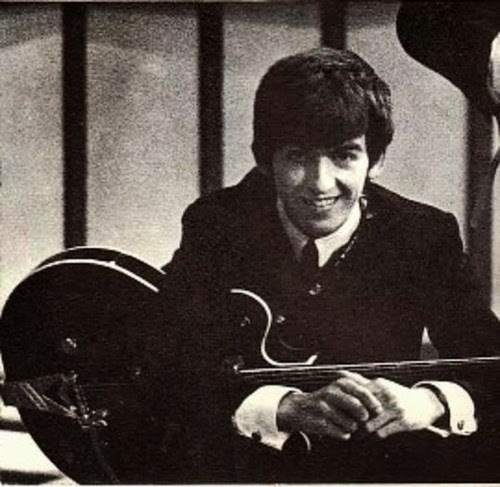 Although John Lennon and Paul McCartney were the band's primary songwriters, most of their albums included at least one Harrison composition, including "While My Guitar Gently Weeps", "Here Comes the Sun" and "Something", which became the Beatles' second-most-covered song. Harrison's earliest musical influences included Big Bill Broonzy, George Formby and Django Reinhardt; Chet Atkins, Chuck Berry and Ry Cooder were significant later influences. By 1965 he had begun to lead the Beatles into folk rock through his interest in the Byrds and Bob Dylan, and towards Indian classical music through his use of the sitar on "Norwegian Wood (This Bird Has Flown)". He developed an interest in the Hare Krishna movement and became an admirer of Indian culture and mysticism, introducing them to the other members of the Beatles and their Western audience by incorporating Indian instrumentation in their music. After the band's break-up in 1970, Harrison released the triple album All Things Must Pass, from which two hit singles originated. He also organized the 1971 Concert for Bangladesh with Ravi Shankar, a precursor for later benefit concerts such as Live Aid. Harrison was a music and film producer as well as a musician; he founded Dark Horse Records in 1974 and co-founded HandMade Films in 1978. Harrison released several best-selling singles and albums as a solo performer, and in 1988 co-founded the platinum-selling supergroup the Traveling Wilburys. A prolific recording artist, he was featured as a guest guitarist on tracks by Badfinger, Ronnie Wood and Billy Preston, and collaborated on songs and music with Bob Dylan, Eric Clapton and Tom Petty, among others. Rolling Stone magazine ranked him number 11 in their list of the "100 Greatest Guitarists of All Time". Harrison's first marriage, to Pattie Boyd, ended in divorce in 1977. The following year he married Olivia Trinidad Arias, with whom he had one son, Dhani. Harrison died in 2001, aged 58, from lung cancer. He was cremated and his ashes were scattered in the Ganges and Yamuna rivers in India, in a private ceremony according to Hindu tradition. After years of being restricted in his songwriting contributions to the Beatles' albums, Harrison released All Things Must Pass. It was a triple album, with two discs of his songs and the third of recordings of Harrison jamming with friends. Regarded by many as his best work, the album topped the charts on both sides of the Atlantic. The LP produced the number-one hit single "My Sweet Lord" and the top-ten single "What Is Life". The album was co-produced by Phil Spector using his "Wall of Sound" approach, and the musicians included Starr, Clapton, Gary Wright, Preston, Klaus Voormann, the whole of Delaney and Bonnie's Friends band and the Apple group Badfinger. In 1971 Bright Tunes sued Harrison for copyright infringement over "My Sweet Lord" owing to its similarity to the 1963 Chiffons hit "He's So Fine". He denied deliberately plagiarising the song, but lost the court case in 1976 as the judge ruled that he had done so subconsciously.